Hi loves! It's that time of the month again, Glam Polish is releasing another 9-piece collection! This month the inspiration is the cut-throat world of celebrity & fashion. The result is a unique set of colors with sparkly finished and names inspired by Fashion Police, The Devil Wears Prada, Celebrities & Famous Fashion Designers. I have 6 out of 9 shades to share with you! 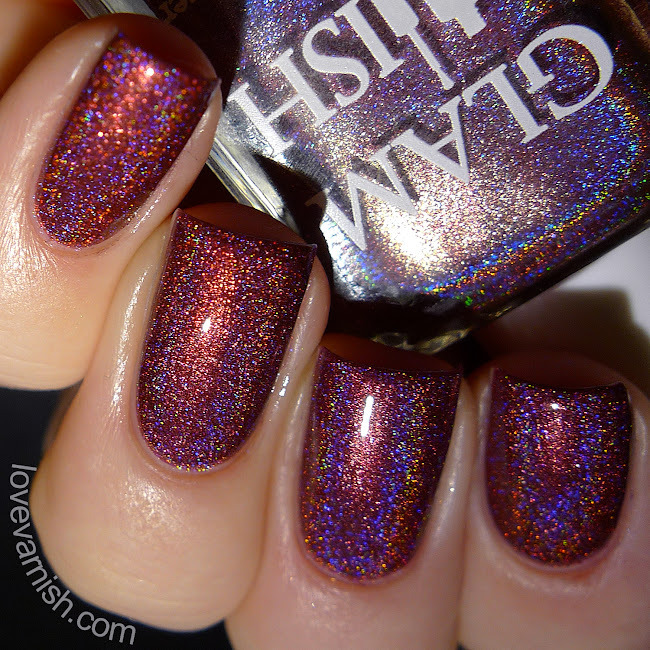 Glam Polish B*#tch Stole My Look is a vampy red intense shade with a holographic finish. The red tone was a bit more intense and bordeaux in real life, and the holographic finish is just perfect! The formula was great too, just 2 easy coats that leveled well. Glam Polish Can you please spell “GABBANA” is a blush intense holographic shade. Quite difficult to capture on camera but a very lovely shade! Just as B*#tch Stole My Look the formula is easy and smooth to work with. Again 2 coats are all I needed. Glam Polish Florals? For Spring. Groundbreaking. is a light lavender holographic with glass flecks and a hint of sparkling holographic microglitter. Such a delicate shade! And surprisingly opaque too, (surprise, surprise) I needed only 2 coats! Glam Polish I don’t do Fashion. I am Fashion. is a shimmering blue with a hint of holographic microglitter. Such an intense shade of blue! It's lit from within it seems, gorgeous. The formula was a bit more tricky, the first coat seemed a bit more patchy but it was opaque in 2 coats. Glam Polish What Exactly is She Wearing? is a holographic charcoal jelly base packed with rainbow microglitter. The rainbow glitter is such a fun addition! And the formula was surprisingly easy to work with based on the amount of it, no clumping or difficult application. Again, just 2 coats for an opaque finish :-). Glam Polish Big Girls Need Big Diamonds is a periwinkle tinted intense silver holographic shade packed with holographic microglitter. This is SO. SPARKLY! Really, it is just blinking away constantly, a real eye catcher (don't wear it while driving ;-)). Annd, can you guess how the formula was? 2 coat perfection :-D! I really liked the versatility of shades in this set, and it's nice to see some new mixes released like What Exactly Is She Wearing?. My favorite is Big Girls Need Big Diamonds, sin ce it's such an eyecatcher, and while the color of B*#tch Stole My Look isn't the most unique out there, it's a lovely vampy shade that I always appreciate. What do you think of these 6 shades? Do you see anything you like? Tell me in the comments! The Glam Polish Queen of Mean Collection is releasing February 4th from www.glampolish.com.au with shipping to Australia and USA. Shipping rates to USA are $3.50 USD for the first polish and an extra $1.00 USD for each additional polish. Glam Polish is also trialing shipping by USPS first class mail to selected countries in Europe, the rates are $13.60 USD for the first polish and $3.30 USD for each additional polish. Labels Glam Polish // Glam Polish B*#tch Stole My Look // Glam Polish Big Girls Need Big Diamonds // Glam Polish Can you please spell “GABBANA” // Glam Polish Florals? For Spring. Groundbreaking. // Glam Polish I don’t do Fashion. I am Fashion. // Glam Polish What Exactly is She Wearing?